God calls every one of His people to positions of leadership and influence–in our homes, communities, churches, and ultimately the world. But true leadership involves more than simply being the person out front; it means living a life worth following. In this study of four important leaders of Israel–Eli, Samuel, Saul, and David–you’ll explore key leadership principles, including how to make wise decisions under pressure, deal effectively with mistakes, and set a course that others will follow. 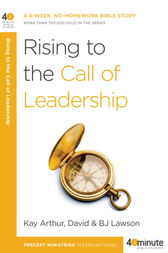 Most important, you’ll learn what God expects of you–and how you can rise to the call of effective leadership.